Oh hay y'all! Pregnancy has been quite a ride and all I'm tryna do is look half decent during it haha.. it's not always easy I'll tell you that. The third trimester has begun and I'm started to get tired with the simplest of things. #BumpLife is real! 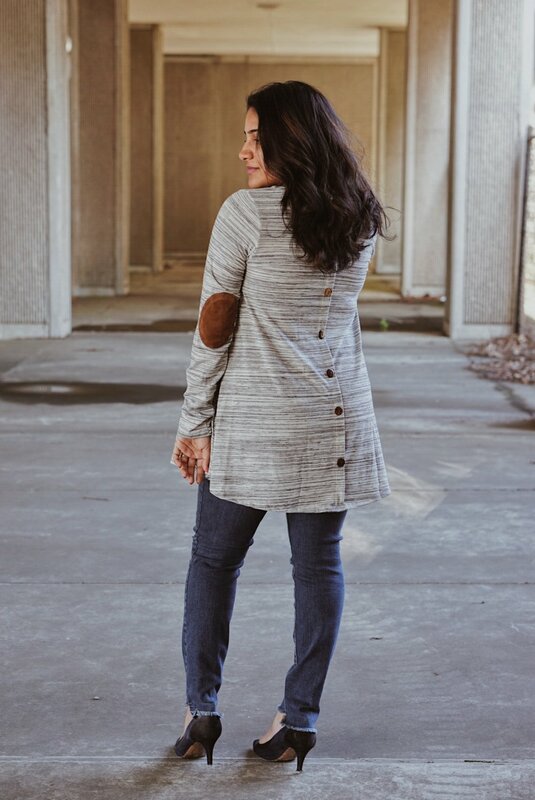 But on a fun note, I'm sharing a cute maternity find today — this super cute elbow patch back-button top from PinkBlush Maternity! I simply love the patches and detail on this top, and it's super flattering with tons of room for your growing bump. I think this is one of those tops that can be worn post-partum just because the cut is pretty tailored and has a fun flare! You can shop it here for only $39! 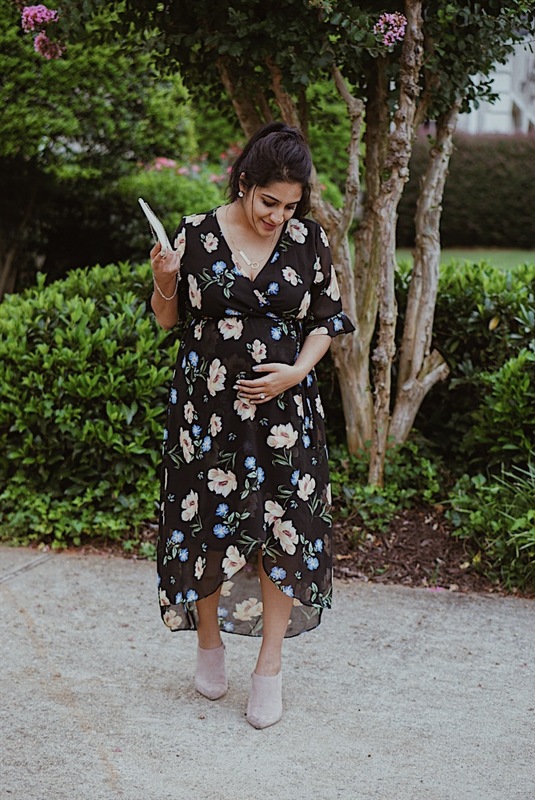 What pieces are you mamas loving from their maternity line? Comment below! There is an excitement involved in shopping once you have a "bump" -- I'm not gonna lie. All the obvious stares, occasional inappropriate comments, and often unasked for belly rubs definitely don't outweigh the personal joy that is a growing bump and the bond you being to create with your lil' blossoming baby. 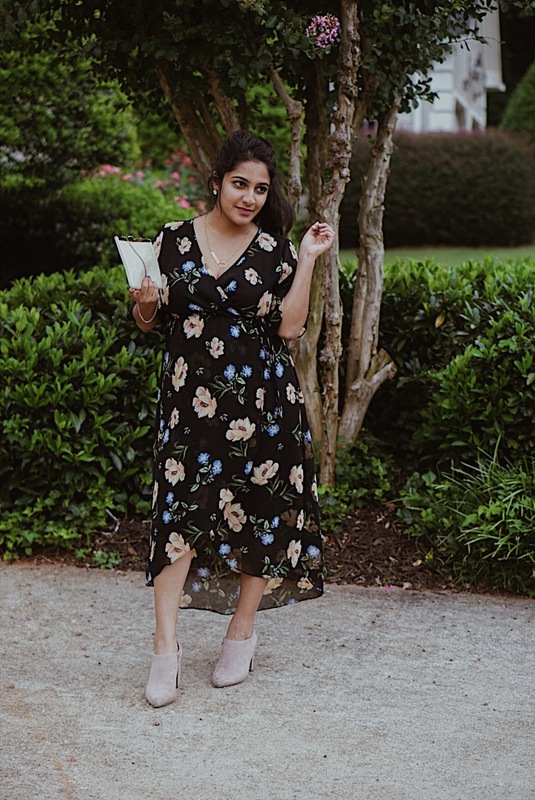 I've been online shopping a lot to find some dresses that will be good post-partum and aren't necessarily only "maternity" but have a general silhouette that could work for me even after baby is here! Fall is finally upon us in ATL (at least in the mornings and evenings) and it's only about to get REAL with the leaves changing colors and true sweater-weather kicking in. Thought I'd go with all black to feature this ONLY $23 distressed denim jacket c/o SheIn; perfect for wrapping around the waist, draping over your shoulders, or wearing normally like a sane person, ha! I can't help but try and get creative with the ways to style outerwear, but this jacket will be perfect for those nights on patios with fire pits or walking over to our fave pubs to catch some MNF. Oh, and this bracelet stack is only $5 yet super durable -- and they go with pretty much everything. Outfit details below!